Find out the size details of a football pitch. The length of a pitch must be between 100 yards (90m) and 130 yards (120m) and the width not less than 50 yards (45m) and not more than 100 yards (90m). 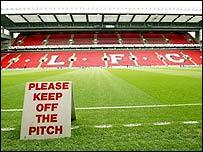 And for all you penalty takers - or savers - out there, the most famous spot in football sits 12 yards (11m) from goal. Think you know how big it is? It's eight feet high (2.44m) and eight yards wide (7.32m).